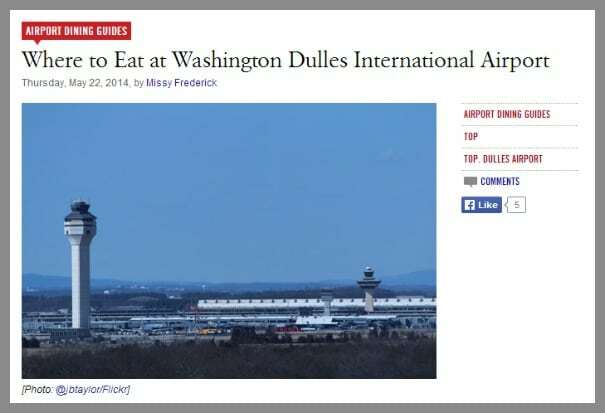 Eater, which bills itself as “the source for people who care about dining and drinking in the nation’s most important food cities,” has updated its Airport Dining Guides for the metropolitan three national and international airports … bon appetit! 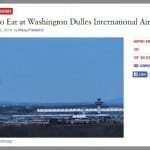 Washington Dulles: Standouts include Five Guys, Harry’s Tap Room, Starbucks Evenings, California Tortilla and Vino Volo Wine Room. Reagan National: Best Bets are Five Guys, Cibo Bistro & Wine Bar, Mayorga Coffee, Matsutake Sushi and Gordon Biersch. Baltimore Washington: Top choices include Obrycki’s Restaurant & Bar, Vino Volo Wine Bar, Sky Azure, Silver Diner and BGR: The Burger Joint.